Agreed, Bel. They are mainly Sunni but have established a secular model of government in Rojava around Afrin and Kobane and their philosophy includes equal rights for women. Previously unheard of in this part of the world. This struggle is to correct Sykes Picot of 1916. What a mess they have left us. For the oil and the Ottoman Partition. We should have asked Lawrence. So you need them as cowboys? Smile when you say that pardner! But of course, most of my life I smile and I must admit, I was laughing at the thumbnail you've attached. There are so many myths about the Eastern Front in World War 2 it's no wonder folks hate to talk about it and then love to point out how their view is the "correct"(objective) one. First off German Tanks ran on GASOLINE so unlike the Russian Tanks which ran on diesel ACTUAL Winter was the Wehtmacht's friend...and this is proven by how the Germans attempted to take Moscow...from the NORTH...in WINTER. So that debunks the "Winter as good for Russia not Germany" myth since in fact the exact opposite was true...at least going into 1942. "Blame Hitler vs Blame Stalin." First off they had a non aggression pact so obviously blaming them both for the actual War is acceptable. As far as operational matters once the Wehrmacht launched a surprise attack there was never any doubt about the nature of the conflict...so I think in that sense Hitler is to blame since Stalin was still fulfilling his side of the deal and sending basically a mountain of raw materials to Germany when the 3rd Reich attacked. Not only that but Hitler did apoint himself "Commander in Chief of the East" after the failure of Typhoon. When the Germans invades Stalin retreated to his Dacha expecting to be shot or hanged as he had done to so many others. In fact the opposite happened. Finally the end of the War was more "political" I think than Military. Yes the Red Army took Berlin, but you still had an "East Germany" that existed too...so in a way the 3rd Reich certainly lost but Germany didn't per se. And indeed ultimately Germany was reunited with its Capital in Berlin in 1991 as agreed to by all of Europe including the United States and Russia...so the biggest myth of all may be that Germany "lost" in the sense that she ceased to exist as a people let alone aa a power of note. Quite the opposite actually. Great Britain lost its Empire, so did France. The USSR collapsed. The USA is total chaos right now. So far at least Germany is a winner...albeit with a mess in Crimea going on. In regards to the gasoline issue the respective reaction of gasoline and diesel to cold weather is a fairly minor issue relative to the preparedness of a military force with regards to cold weather. In other words your conclusion is not well supported by the facts you presented and indeed based on many other well known factors is more than likely wrong. In regards to winning or loosing the war. Nazi Germany lost it ceased to exist end of story. The UK was divesting itself of much of the Empire anyway WWII speeded it up but that hardly constitutes loosing the war. Likewise the USSR survived for several decades after the war so you can hardly credit WWII with their dissolution. Likewise the USA is hardly in "total chaos" right now, we may have some rather questionable candidates running for president but that's hardly attributable to WWII. In summary calling your position a bit of a stretch is on the mild side. as Germany was gearing up for the invasion of the Soviet Union and rather than taking the long way to the front over land, they chose a much quicker way. They were ferried from the port of Patras, Greece across the Adriatic Sea to the port of Taranto, back to Italy. Kybfels was a cargo ship of 7,764 tons owned by HANSA Bremen. Marburg, just below 7,564 tons, was built in 1928 for the company North German Lloyd. A previous convoy on May 18, 1941, including those two ships and the Italian transport ship Laura C. transferred via the same route, from Patras to Taranto, the heavy guns and tanks of the 2nd Panzer Division and then returned to Patras to load the remaining tanks, as well as other vehicles and personnel from the Division. The submarine sailed from Taranto on May 18th and on the evening of the 20th the Italians saw a silhouette of an unknown ship in the area. It later proved to be the mine layer HMS Abdiel, which set the minefield that would cause so much damage to the Axis powers. Shortly afterwards, the Italian destroyer Carlo Mirabello, coming from Italy to Patras, hit a mine and sunk. The Italian gunboat Pellegrino Matteucci followed, while accompanying an Italian convoy. The most probable reason why the Italians did not warn their German allies of the minefield is that during that time, their relations went sour, the cooperation between the fascists and the nazis in Patras was strained and consultation between the two sides was virtually non-existent. On May 21st, 1941, at 9:00 in the morning, Kybfels and Marburg were being loaded with vehicles and artillery of the 2nd Armoured Division, with the port of Taranto as their destination. From Italy, they would be carried by rail to the Eastern Front, for Operation “Barbarossa”. This time, the two ships would be on their own, apart from Italian reconnaissance aircraft that would fly over them. At 14:00 hrs, while the convoy was between Kefalonia and Lefkada islands, a terrible explosion was heard. Kybfels had struck a mine! Shortly afterwards Marburg hit a mine too and started to sink! The minefield was set just the day before by the British mine layer HMS Abdiel, between Kefalonia and Ithaki islands. The exact location of this minefield, in a busy route the Axis shipping used frequently cannot be attributed just to luck. It appears that the British had a very well organised intelligence service in Patras that monitored all the moves of the Axis shipping. In the book by Kostas Triantafillou, “Historical Dictionary of Patras” it is documented that two Greeks, Martakos and Skamnakis, were arrested “on suspicion of reporting the movements of ships to the enemy” (i.e. the British). 226 Germans were killed or drowned with the two ships, while survivors swam to Lefkada and Kefalonia islands. HMS Abdiel went down in history as the first mining operation in very deep waters, which surprised the Axis powers in the Mediterranean. 1) Coordination between German and Italian troops was poor due to sour diplomatic relation. 2) Going to Soviet Union is easier from sea route and rail than on ground land: in this case, sailing to Italy and on rail to the SU. 3) British had enough intelligence about Axis shipping in the Med. to conduct mine-laying ahead of time. 4) Italian did not attack or coordinate attacks on their own despite they were aware British had been mine laying. These points are going to be useful if a what-if topic pops up. I agree that the winter thing is overdone---while the extreme cold of Dec. 1941 was a slight Soviet advantage, they still had to operate in the same extreme, deadly cold. However better some of them might have been equipped with winter gear and the fact that many soldiers lived in areas where extreme cold was common in winter etc, I cannot imagine that it wasn't incredibly difficult to deal with the cold and mount military operations. Yeah but when the thrusts of West Front failed to secure intact villages or cities like Rhzev and Vyazma or Sychevka, the winter worked for the germans as did the stand fast order. The krauts remained in sheltered positions while Ivan had to deal with the extreme cold in the open. The result was exhaustion of the soviet forces and that let the 9. Armee hold an untenable front, even thought the Toropets breakthrough paired with the Suknichi breakthrough really threatened to engulf the entire Armeegruppe Mitte. Check map if you don't believe me. JJWilson and green slime like this. The main theme in winter fighting is the proper clothing and especially daily warm meals. No warm meals and proper rest in warm you only lose your personal reserves all the while. We had in winter war Sections destroyed in surrounded Soviet units one by one while other men were resting in a warm tent and the troops were changed every 6-8 hrs while the Red Army could not make a fire or rest anytime. German doctrine also stipulated that attacks conducted in extreme cold shall be more limited than in warm seasons because the days are short and the snow not only bogs down momentum but also dry reserves as you appointed. Against popular beliefs, stavka committed a huge mistake by launching a large offensive operation with deep goals in extreme cold. I'm of the opinion that they also committed the same mistake in both Saturn and Mars, and even in 1943-44 winter when they failed to destroy Heeresgruppe Sud in Ukraine. Unlike what's told in most documentaries and popular texts, the germans really mastered winter warfare far beyond anyone else. They evolved from a concept of elastic defense they inherited from WWI into a mixture of techniques (stand fast, fire brigades, backhand bow, shield and slay, etc) that let them hold an untenable front and even conduct limited offensives during four years, despite the odds where clearly against them. green slime and JJWilson like this. The Red Army made Stalin's mistakes until late 1942 In 1941 december despite Zhukov's demands they made an offensive all along the front. Zhukov demanded a strong point where troops would be concentrated but failed to convince Stalin. This might have saved the Germans. 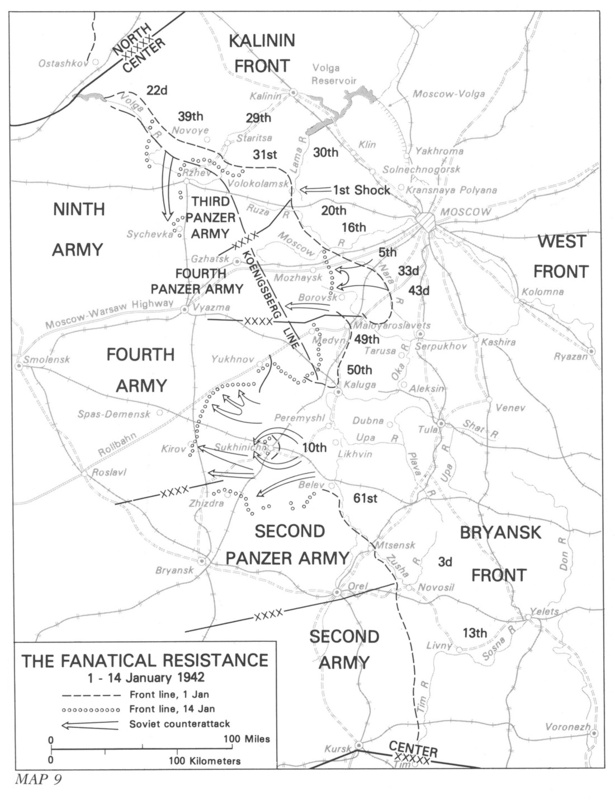 In Kursk Zhukov demanded the defensive lines would exhaust the German attack and then they would counter which worked greatly.